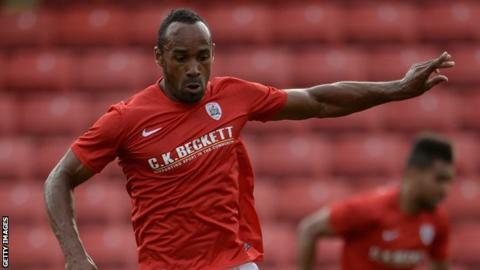 Chris O'Grady missed a late penalty as Barnsley moved closer to relegation to League One with defeat at Bolton. Jermaine Beckford had put the hosts in front, rounding Luke Steele and tapping into an empty net. The visitors thought they would claim a point when Ryan McLaughlin was brought down by Alex Baptiste. But O'Grady could only hit the woodwork as Barnsley slumped to the bottom of the Championship, five points from safety with only five games left. Bolton have now won three of their last four games, and lost just one in 12, although it has come too late to push them into play-off contention. Beckford almost scored from Chung-Yong Lee's pass but his ninth goal of the season was not long in arriving. Barnsley's defence got themselves in a muddle as Matt Mills launched a long punt forward, allowing Beckford the easiest of chances. The former Everton striker spurned a similar chance after the break but Barnsley were unable to rescue themselves, O'Grady's miss condemning them to a fifth defeat in eight games. Bolton manager Dougie Freedman: "Was I disappointed in conceding the penalty? I was very disappointed with it. "You could sense it coming because they were throwing everything at us and we were going up the other end and if we don't finish with a goal you're going to be vulnerable on the counter attack. "I was disappointed in giving away a penalty and they will be more disappointed with missing it but I was more concerned that we didn't finish it off at the other end." Barnsley boss Danny Wilson: "How do I feel? I feel let down. "I feel let down by some of the decisions that were made against us today and I feel delighted in the performance because I thought the lads did ever so well. "I think that we deserved something out of the game and I don't just think the one point. I think we deserved to be winning the game." Match ends, Bolton Wanderers 1, Barnsley 0. Second Half ends, Bolton Wanderers 1, Barnsley 0. Attempt blocked. Nick Proschwitz (Barnsley) right footed shot from outside the box is blocked. Assisted by Patrick McCourt. Attempt missed. Dale Jennings (Barnsley) right footed shot from outside the box is high and wide to the right. Assisted by Kelvin Etuhu. Attempt missed. Jermaine Beckford (Bolton Wanderers) header from the centre of the box is too high. Assisted by Alan Hutton with a cross. Attempt missed. Lewin Nyatanga (Barnsley) left footed shot from the centre of the box is too high following a set piece situation. Jay Spearing (Bolton Wanderers) is shown the yellow card for a bad foul. Stephen Dawson (Barnsley) wins a free kick in the attacking half. Substitution, Bolton Wanderers. Zat Knight replaces Alex Baptiste. Offside, Barnsley. Liam Lawrence tries a through ball, but Ryan McLaughlin is caught offside. Penalty missed! Still Bolton Wanderers 1, Barnsley 0. Chris O'Grady (Barnsley) hits the bar with a right footed shot. Penalty conceded by Alex Baptiste (Bolton Wanderers) after a foul in the penalty area. Penalty Barnsley. Ryan McLaughlin draws a foul in the penalty area. Corner, Barnsley. Conceded by Adam Bogdan. Attempt saved. Dale Jennings (Barnsley) right footed shot from long range on the left is saved in the bottom left corner. Assisted by Liam Lawrence. Hand ball by Patrick McCourt (Barnsley). Attempt blocked. Lukas Jutkiewicz (Bolton Wanderers) left footed shot from outside the box is blocked. Assisted by Jermaine Beckford. Attempt missed. Patrick McCourt (Barnsley) right footed shot from the right side of the box misses to the left. Assisted by Ryan McLaughlin. Attempt missed. Lukas Jutkiewicz (Bolton Wanderers) header from the centre of the box misses to the right. Assisted by Neil Danns with a cross following a corner. Attempt missed. Lukas Jutkiewicz (Bolton Wanderers) header from the centre of the box misses to the left. Assisted by Neil Danns with a cross following a corner. Corner, Bolton Wanderers. Conceded by Lewin Nyatanga. Substitution, Bolton Wanderers. Lukas Jutkiewicz replaces André Moritz. Attempt missed. Ryan McLaughlin (Barnsley) header from the right side of the six yard box is high and wide to the right. Assisted by Dale Jennings with a cross. Substitution, Bolton Wanderers. Neil Danns replaces Robert Hall. Substitution, Barnsley. Patrick McCourt replaces Tomasz Cywka. André Moritz (Bolton Wanderers) wins a free kick in the defensive half. Foul by Liam Lawrence (Barnsley). Attempt saved. Jermaine Beckford (Bolton Wanderers) left footed shot from the centre of the box is saved in the centre of the goal. Assisted by Robert Hall with a cross. Foul by Tomasz Cywka (Barnsley). Robert Hall (Bolton Wanderers) wins a free kick in the defensive half. Foul by Kelvin Etuhu (Barnsley). Attempt missed. Chris O'Grady (Barnsley) right footed shot from outside the box misses to the right. Assisted by Thomas Kennedy following a set piece situation. Foul by André Moritz (Bolton Wanderers). Ryan McLaughlin (Barnsley) wins a free kick on the right wing. Attempt missed. Ryan McLaughlin (Barnsley) header from the centre of the box misses to the right. Assisted by Thomas Kennedy with a cross. Attempt blocked. Liam Lawrence (Barnsley) right footed shot from outside the box is blocked. Assisted by Dale Jennings.